A new administration signals dramatic change. It could be tough, but social workers must rely on their core mission, values, and ethics to navigate the challenges that may arise over the next four years. Editor's Note: There is a time gap between editing and publication during which changes cannot be made, so this article would not reflect any late-breaking news regarding the administration or policy actions affecting social services. November 8, 2016, could be a defining date in social work's history. The election of Donald Trump as the nation's 45th president sent shock waves through many sectors of American society, and social work is no exception. The election has left the profession asking many questions about itself and its future. What are the implications for social work practice and education? The election results also elated millions of people. What can social workers do to connect with those who believed they had been forgotten and voted for Trump? What can social workers do to help heal the deep divisions that the election exposed? How can individual social workers respond? Social Work Today spoke with several social workers around the country as they contemplated the role of the profession during the Trump administration. All acknowledged that challenging days lay ahead, but they also expressed the belief that social work now has an unprecedented opportunity to unite and act on behalf of vulnerable populations. In short, this is social work's time to shine. "I really think social work is going to flourish," says Ginger Poag, MSW, LCSW, a psychotherapist with Nashville Concierge Counseling in Tennessee. "I'm really excited for the profession because we get to put everything we've learned into practice. It's not going to be easy, but it can be done." There is little doubt that President Trump's policies—from changes in the health care system to restrictions on immigration and rollbacks of environmental regulations—will have significant effects on the vulnerable populations with whom social workers engage every day. For example, acceleration of the erosion of the welfare state through tax cuts, budget cuts, and privatization will mean fewer resources for social programs, which will result in a reduction of services for clients and a shrinking number of jobs for social workers, says Mimi Abramovitz, DSW, Bertha Capen Reynolds Professor of Social Policy at Hunter College's Silberman School of Social Work in New York. This trend will have the most impact on women and people of color, who make up the majority of clients and social workers, Abramovitz says. In addition, Abramovitz worries that Trump's attacks on the press and adherence to conspiracy theories about voter fraud could lead to voter suppression and a growing fear among people in and outside of government to criticize the president's policies. "There's really a threat to our democracy if people are afraid to speak out," she says. Chad Dion Lassiter, MSW, agrees that social workers are likely to see a great deal of negative emotions among clients uncertain about their futures under Trump. "Aspects of America are going through 'posttraumatic election disorder,' and social workers have to be there for people who feel depressed and betrayed … [social workers] need to bring comfort to chaos," says Lassiter, president of Black Men at Penn School of Social Work, Inc., which works to recruit black men into the social work profession. John Mathews, LCSW, of Virginia Counseling in Chester County, VA, has seen clients' fears about the election firsthand. Although most of Mathews' clients see him because of issues unrelated to the election, some clients—often women and people of color—have brought it up. "I had a number of clients who were distraught about the election and what it might mean for them and for the country in general," he says. Trump's election is also likely to reignite debate over the role of "case vs. cause" in social work. Historically, there has been a tension in the profession between practitioners focused on social reform and political action and those focused on psychotherapeutic interventions with individuals and families. The election might be a sign that the profession needs to pay more attention to the importance of being active in advocacy for social and economic justice, says Danielle Geary, PhD, MSSW, APSW, chair of the social work department and an assistant professor of social work at Carthage College in Kenosha, WI. "I saw this election as a potential consequence of not doing enough [to advocate for vulnerable populations]," Geary says. "Political action and advocacy have to be a necessary part of what we do as social workers." The social work profession needs to recognize that there is a disconnect between the profession's professed identity as a fighter against injustice and discrimination and how the profession is often practiced on a day-to-day basis, says Michael Reisch, PhD, MSW, Daniel Thursz Distinguished Professor of Social Justice at the University of Maryland School of Social Work in Baltimore. For example, the therapeutic frameworks that clinicians use to inform their practice may not consider the effect of social and community change on clients. In addition, clinicians often do not work in community-based agencies but instead in private offices and homes that separate them from marginalized populations. "If people think they can practice in hermetically sealed environments, they're deceiving themselves," Reisch says. Individual social workers might not be the only ones renewing their commitment to activism. Social work agencies and nonprofits may start to consider ways they can become more vocal about the impact of Trump's policies while remaining mindful of tax laws that may restrict their political activity, says Jeffrey L. Reynolds, PhD, CEAP, SAP, president and CEO of the Mineola, NY-based Family & Children's Association, which offers a variety of programs focused on issues such as addiction, behavioral health, and homelessness. "If there's a policy change happening that is going to affect our clients, we need to talk about it," Reynolds says. "We need to talk about the potential impact, not just wait for it to happen." Another area in which Trump's victory will be felt is in social work education. Lassiter asserts that Trump's presidency will transform social work classrooms into laboratories where students can study how his policies directly affect families, children, elders, incarcerated individuals, and other groups. It also hopefully will lead to a more open dialogue among social work researchers at academic institutions, social work educators, and social work practitioners about how they can work together to study and address issues of inequality and marginalization, says Mark E. Courtney, PhD, a professor at the University of Chicago School of Social Service Administration. Despite the increased opportunities for social work students to get involved in social activism and grassroots organization, Geary fears that some students will want to remain on the sidelines because the presidential campaign was so contentious and the political environment is so toxic. "I think we really disempowered the youngest people. They think that the political process is disgusting, that it's ridiculous," Geary says. "They might think that it's such a broken system, then why even try [fixing it]." But now is not the time for anyone in social work to give in to despair and cynicism about what the profession can achieve, according to Reynolds. "We don't have time for hand-wringing, head-shaking, and gloom. This is our time to do what we do best," he wrote in an e-mail to Social Work Today. "My peers aren't discouraged; they are enraged, and they are energized." 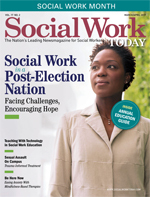 As shocking as the outcome of the election was to many social workers, the silver lining in the situation is that the Trump presidency gives social work many opportunities to raise its profile as a profession dedicated to social justice and demonstrate its ability to heal the deep divisions that the election exposed, Lassiter says. "The profession has been put front and center," he says. There are several ways social workers can raise their visibility. One way, Lassiter says, is for more social workers to make appearances in the media, ranging from articles in local newspapers to interviews on major television networks. Lassiter argues that social workers are uniquely positioned to talk about a variety of issues facing the country because of their knowledge of the experiences of the clients, neighborhoods, and communities with which they work. Social media also provides social workers an outlet to share information, organize, and advocate, says Richard P. Barth, PhD, MSW, dean and a professor at the University of Maryland School of Social Work. Barth says social media can be an especially effective way for social workers to mobilize quickly when policy changes, such as reductions in Medicaid, hardships from new immigration orders, and the elimination of the Affordable Care Act, directly harm vulnerable populations. "Social media dominated the election, and it will dominate the postelection period," he says. In addition, several observers told Social Work Today they believe that an increasing number of social workers will pursue elected office at all levels of government. They argue that social workers make ideal candidates because they have a combination of communication, advocacy, and relationship-building skills, along with the knowledge of issues that affect individuals, families, and communities. Many social workers may see politicians as distasteful, but they also are realizing that just lobbying politicians is not enough, Reynolds says. "[Social workers are] thinking that they don't only need to be knocking at the door of politicians, but that they need to be at the table," he says. "I know a lot of folks who are saying, 'I've never contemplated [a run for office] before, but things are so bad that I have to do something.'" The same skills that make social workers good potential political candidates may have another purpose, as well. Observers say social workers are well equipped to help bridge the societal divides deepened by the election and reach out to the populations with whom President Trump connected—for example, those in rural areas and those in areas decimated by the loss of manufacturing jobs. It's not necessarily that social work is out of touch with these populations, Geary explains, but the profession may have underestimated the power of their frustration, anger, and feelings of being left out. The social work profession needs to work to increase these groups' access to services and support the social workers who are already serving them, Courtney says. An important role of social workers during the Trump administration, Courtney adds, will be to raise awareness of the shared experience of all marginalized populations, no matter their political persuasions. "The common theme is that the people of the bottom of the pecking order are feeling left out and marginalized," he says. "It's important for social workers to point out that commonality." In such a politically divided environment, social workers should take the opportunity to engage with audiences outside of their typical circle of colleagues and clients, says Marc Herstand, MSW, CISW, executive director of the Wisconsin chapter of NASW. These conversations may not be not be comfortable, but are necessary for there to be a greater understanding of other people's perspectives on the issues facing the country and to build coalitions to address these issues. "Start where the client is; that's a good thing to remember when you're working with people politically," Herstand says. Working across differences is not something social workers should do just with external audiences. Barth says the profession also needs to consider how it can foster a more open and respectful dialogue internally among social workers of various political viewpoints, including social workers who are conservatives. "We do need to recognize the importance of the diversity of the profession," Barth says. "People come to social work for a lot of different reasons, so we can't think there's only one way to achieve our goals. We aren't going to make the progress we need if we believe that we are all in agreement and only talk to others like us." So, how should individual social workers make their voices heard during the Trump administration? Protest? Write letters? Donate to like-minded organizations? Something else? Geary says each social worker has a unique role to play—the important part is that each social worker does something. "One of the worst things we can do over the next four years is to remain silent," she argues. The first step for social workers is to recognize that whatever they are doing on even the smallest levels will make a difference, Herstand explains. "Never, ever give up hope that change can happen. Know that this is a marathon process—the setbacks will happen—but we will get change," he says. "We must speak out and keep doing the wonderful work we're doing every day." There are many sources of inspiration for social workers trying to figure out how they should get involved, Lassiter says. Among his suggestions are reading the NASW Code of Ethics, journaling, and connecting with other social workers to learn about what they are doing. Courtney recommends social workers identify action items that fit with an issue they're passionate about, whether that be the environment, income equality, or something else. "Pick your topic, and look for the connection to marginalized populations," he says. Geary is concerned that social workers already dealing with funding cuts and growing workloads may lack the energy to devote to community organizing and grassroots advocacy. Reynolds acknowledges that a significant challenge for social workers will be maintaining their momentum and commitment to action over the next four years when policy changes and threats to vulnerable populations may arise on a near-daily basis. But, he adds, social workers can help combat any fatigue by mobilizing others, including clients, to get involved. "We need a much bigger army of folks adding their voices," Reynolds says. Social workers must help each other remain resilient in tough times, Lassiter says. That involves engaging in self-care and tapping into the passion and commitment that brought them into the profession in the first place. Poag agrees. "It's so easy to start feeling desperate and overwhelmed and feeling that there's no hope," she says. "But we can do this. We can come together as social workers and make a big change. I believe we are the people who are most prepared to take on this challenge." — Christina Reardon, MSW, LSW, is a freelance writer based in Harrisburg, PA, and an editorial advisor at Social Work Today. Many people are attracted to careers in social work because of the profession's commitment to social justice. But some social workers choosing to express that commitment during the Trump administration may find themselves entangled in ethical dilemmas. The NASW Code of Ethics is clear that social workers have an obligation to advocate on behalf of vulnerable and oppressed populations. For example, the preamble lists service, social justice, and dignity and worth of the person as among the profession's core values. Standard 6.04a states, "Social workers should engage in social and political action that seeks to ensure that all people have equal access to the resources, employment, services, and opportunities they require to meet their basic human needs and to develop fully" (NASW, 2008). However, the code also reminds social workers that they have a responsibility to promote the well-being of their clients. Social workers need to consider how their political activities may affect their relationship with clients, says Frederic G. Reamer, PhD, a professor at Rhode Island College's School of Social Work. For example, what if a client who supports one of President Trump's policies finds out that a social worker attended a march protesting that policy? "[Political activity in opposition to a client's beliefs] can rupture the relationship. The client may feel angry or uncomfortable," says Reamer, who chaired the task force that wrote the current Code of Ethics. "That's a risk that social workers take." Reamer says he does not want to discourage social workers from becoming more politically active; in fact, he welcomes it. But he urges social workers to consider the implications of that activity. The risk of affecting relationships with clients can be especially high in certain situations, such as when a social worker runs for political office where visibility is increased due to media coverage. A social worker's position and/or place of employment may also be a factor, Reamer adds. For instance, a social worker in a position that requires the appearance of political neutrality may need to find ways to get involved that aren't as visible as a social worker who does not have that restriction. Even if a client discovers that a social worker has engaged in political activity with which the client disagrees, that does not necessarily mean that the therapeutic relationship has to be terminated, Reamer says. Actually, it can lead to a constructive process where the client learns valuable lessons about dealing with differences. "It could lead to an 'a-ha' moment," he says. National Association of Social Workers. (2008). Code of ethics. Retrieved from https://www.socialworkers.org/pubs/code/code.asp.